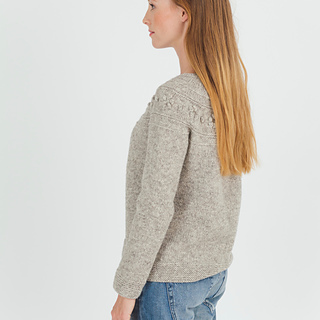 This design is available in English and French and is part of ‘Strong and Free’, a Canadian themed collection created in collaboration with Josée Paquin (UandIKnit). Ce modèle est disponible en français et anglais et fait partie de la collection canadienne ‘Fort et Libre’ créée en collaboration avec Josée Paquin (UandIKnit). 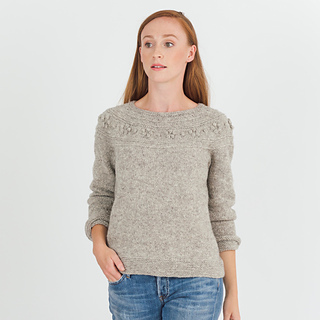 This round yoked pullover is worked from the top down, in once piece, and captures the essence of wild roses. The sweetness created with the bobbles is toned down with the use of a beautiful rustic yarn. Make a size with positive ease, or make it more fitted. The instructions include optional waist shaping if you prefer a more fitted shape.